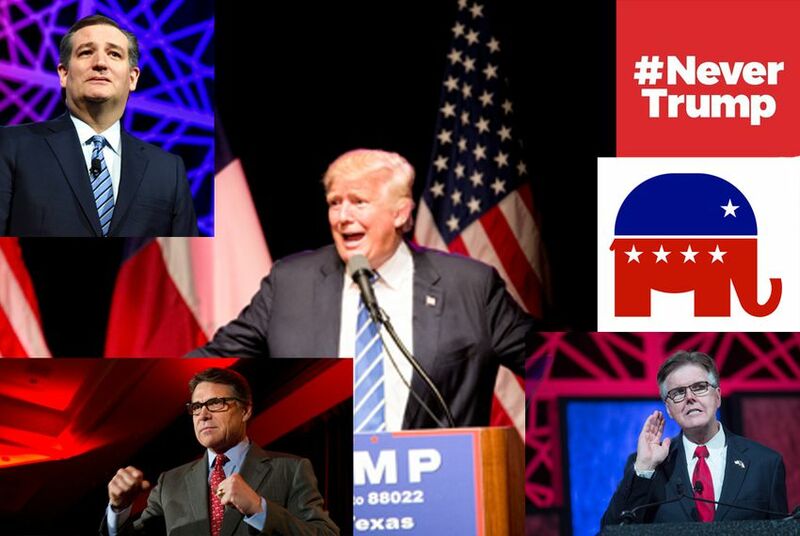 Two months ago, Texas Republicans gathered in Dallas for a state convention at which many still felt conflicted about their presumptive presidential nominee, Donald Trump. As they pack their bags for the national convention, an ambivalence still lingers over the Texas GOP. The state's biggest-name Republican, U.S. Sen. Ted Cruz, still has not thrown his support to Trump, his vicious rival in the primaries. Gov. Greg Abbott, arguably the most popular GOPer in Texas, is largely silent on Trump nowadays — and when he does discuss the presidential race, he rarely uses the T-word. Meanwhile, the only Republican in a competitive race in Texas, U.S. Rep. Will Hurd of San Antonio, is steering clear of Cleveland altogether, as is a rising star: Land Commissioner George P. Bush. Make no mistake, though: Trump still has some enthusiastic supporters in high places in Texas. They include Lt. Gov. Dan Patrick and former Gov. Rick Perry, and many more who cannot stomach standing aside as presumptive Democratic nominee Hillary Clinton cruises to victory. After a long period of uncertainty about what role he would have in Cleveland, Cruz agreed earlier this month to speak at the convention following a meeting with Trump. Cruz has since pushed back on the idea, raised by even some of his supporters, that his decision to address the convention is somehow a capitulation to Trump or tantamount to an endorsement. "Our country’s facing enormous challenges, and I do not believe it is the responsible choice for conservatives to shy away from defending the principles we believe in, from talking about who America is and how we go forward to get on a better path, and that’s what I intend to do at the convention," Cruz said in an interview earlier this month with conservative radio host Glenn Beck. Few anticipate Cruz will bend much in his speech when it comes to Trump, for whom he has still not expressed any support, let alone offered a formal endorsement. Instead, Cruz is expected to at least use the platform to argue for the continuation of the conservative movement — much like he did two months ago at the state GOP convention. Looming over Cruz's stay in Cleveland will be his own political ambitions, which are already believed to include a do-over bid for the White House in 2020. But in one potential sign Cruz is not yet ready to fully stoke those embers, he is not scheduled to address the delegations in early voting states such as Iowa and New Hampshire. Will Trump change any minds? The primary goal of any convention is to bring together a party together behind a nominee. That is especially true in the case of Trump, who made no shortage of intra-party enemies — particularly in Texas — in the bloody primary and is still being shunned by some corners of the GOP. "I think he needs to unify the party as much as possible, and I know that’s hard because we had a hard-fought primary," U.S. Sen. John Cornyn of Texas told reporters Wednesday when asked what Trump needs to accomplish in Cleveland. Among the Texas Republicans heading to Cleveland are a slew of statewide officials, state lawmakers and members of Congress who are still not 100 percent behind Trump or might be like House Speaker Joe Straus, whose latest position on Trump is simply unknown. Can Trump's convention nudge them in the right direction? One factor could be Trump's selection Friday of Indiana Gov. Mike Pence as his running mate. The former congressman is a familiar face to many Republicans representing Texas in Washington, especially U.S. Rep. Jeb Hensarling of Dallas. Cornyn said Wednesday that Trump's vice presidential pick would be an important part of the unification process, and the senator has since spoken positively about Pence's selection. Patrick, who formerly chaired Cruz's campaign in Texas, has emerged as Trump's most outspoken advocate among elected officials in a state party that is less than united behind the presumptive nominee. Patrick accompanied Trump on part of his swing through Texas last month, helping him raise money in San Antonio and Houston and delivering a full-throated introduction at a rally in The Woodlands. In media appearances, Patrick has vigorously defended Trump, including against efforts to derail his nomination in Cleveland. "Donald Trump's our nominee, and I don't have a lot of patience for the Never Trump people because we can't have Hillary," Patrick said in an interview earlier this month on Lubbock radio. With Abbott skipping Cleveland due to burns he suffered on vacation, Patrick will be the highest ranking statewide official representing Texas at the convention. Furthermore, Abbott has asked Patrick to replace him as chairman of the Texas delegation — a largely ceremonial role but one that will no doubt broaden Patrick's profile there. "I’m excited about the convention and looking forward to hearing from our nominee Donald Trump," Patrick said in a statement Friday. "I believe it’s going to be a terrific year for Republican candidates from the top of the ballot to the bottom, all across America." Delegates hoping to deprive Trump of the nomination were dealt a major setback Thursday, when the RNC Rules Committee killed a plan to let delegates bound to Trump vote for someone else. Still, some in the anti-Trump movement are vowing to soldier on, a determination that extends to some parts of the Texas delegation. "We have not given up hope," said Grant Moody, a delegate from San Antonio who is part of the anti-Trump group called Free the Delegates. "We will adjust our strategy ... but it’s not over yet." Moody said "several dozen" of Texas' 155 delegates are supportive of his group's cause, and he expects more to sign up once he has the opportunity speak with them in Cleveland. "There’s some yeses, there’s some maybes, but there aren’t many hard noes out there," Moody said. In any case, some anti-Trump delegates believe they have already left their mark on the billionaire's candidacy by forcing him to be more attentive to the conservative wing of the Republican Party. Among them: Sondra Ziegler, a delegate from Lubbock who wrote to RNC Chairman Reince Priebus earlier this month, telling him anti-Trump delegates are "trying to save you from yourself." "I think that we definitely had an effect," Ziegler said Friday. "You could argue that Ted Cruz’s being invited to speak and possibly even Donald Trump's choice of vice presidential nominee has been influenced by the pressure that conservatives have brought through this effort." The former Texas governor, twice-failed presidential hopeful and former Trump critic has done little to conceal his eagerness to serve in a Trump administration. While Perry did not make Trump's shortlist for running mate, the billionaire has said he wants to get Perry "involved in some capacity at a high level." Perry will have an opportunity to build his case in a speaking slot at the convention Monday night, when the theme is "Make America Safe Again." A person very close to Perry is also speaking Monday night: Marcus Luttrell, the former Navy SEAL whom the Perry family took in years ago. It remains to be seen, however, where the Perry-Trump relationship stands following a recent interview in which Perry expressed some skepticism about the feasibility of one of Trump's signature proposals: building a wall along the U.S.-Mexico border. "There are some that hear that this is going to be 1,200 miles from Brownsville to El Paso, 30 foot high," Perry said in the interview with Snapchat. "And listen, I know you can't do that."